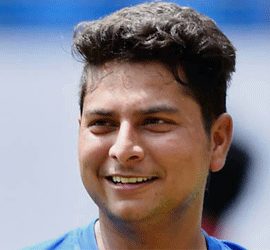 Kuldeep Yadav is an Indian cricketer who plays for Uttar Pradesh. He started as a fast bowler when he first joined a cricket academy in Kanpur, but was asked by his coach Kapil Pandey to switch to something much rarer - chinaman. A slow left-arm chinaman bowler, he played for India Under-19 cricket team in the 2014 ICC Under-19 Cricket World Cup where he took a hat-trick against Scotland, he also takes a hat-trick in one day inernational against world champion Australia at the Eden Gardens Stadium, Kolkata. 21-Sep-2017: Kuldeep Yadav becomes 3rd Indian to bag an ODI hat-trick after Chetan Sharma and Kapil Dev.